Hotel Catalonia Plaza, Barcelona. Catalonia Plaza Hotel Barcelona. The Hotel Catalonia Barcelona Plaza is a big hotel that offers 338 soundproofed rooms, right in the center of Plaza España, Montijuic and the Fira de Barcelona. This ideal location makes it the perfect destination for those travelling for business or leisure. The hotel has 12 meeting rooms that are ideal for organizing meetings, special events, or business related conferences. The gardened marquee is a lovely setting for those who need to plan a cocktail function, dinner or special family occasion. The hotel's beautiful position has fantastic views of Plaza de España, the Fountains and the Palace of Montjüic and is close to many important sites. 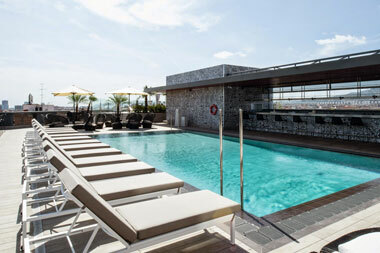 The rooftop swimming pool is not to be missed! Here guests can relax in the sun with amazing views over the city. For those who enjoy a work out, the gym is available with all the equipment necessary. Enjoy the beautiful buffet style breakfast served in the garden room. Here you will find all you breakfast favorites in a comfortable, bright setting. Enjoy Barcelona!